What is the BJP's Ladakh Strategy? The BJP has grand electoral plans for Kashmir, beginning with the Buddhist-majority Ladakh region. As Ankit reported recently, Indian Prime Minister Narendra Modi visited the remote northern state of Jammu and Kashmir this week. On his visit to Kashmir, he reaffirmed his commitment to the development of Jammu and Kashmir and criticized Pakistan for its role in stirring up trouble in the state. While Modi spoke about his dreams for the state of Jammu and Kashmir as a whole, it is especially telling that he visited Leh and Kargil, cities in the Ladakh region of that state while avoiding the more populated Kashmir Valley. In some ways, Modi’s visit to Jammu and Kashmir can be seen as a visit to Ladakh — a fact that has broad implications for Ladakh’s future and how the ruling Bharatiya Janata Party (BJP) views the region. The state of Jammu and Kashmir is composed of three regions: the Muslim-majority Kashmir Valley, Hindu-majority Jammu, and Buddhist-majority Ladakh. Muslims make up the majority of the state of Jammu and Kashmir as a whole, but are minorities in Jammu and Ladakh. Of the three regions, Ladakh is the most remote, separated by high mountains from both the rest of Kashmir and from India itself. It is a high altitude desert plateau nestled high in between the Karakorum Range and the Himalayas. It is host to a relatively low population of around 300,000 people. Interestingly, the world’s second coldest inhabited location is allegedly in India of all places — the town of Dras in Ladakh. The people of Ladakh are related to Tibetans, follow Tibetan Buddhism, and speak Ladakhi, which is derived from Tibetan. 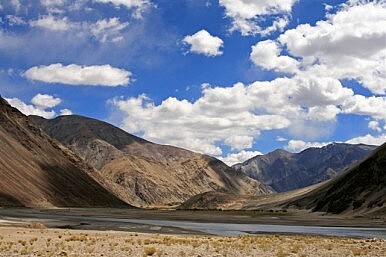 Due to its geography and culture, Ladakh is often isolated and neglected by the rest of India, both politically and culturally although its picturesque scenery is often used for Bollywood song shoots. Despite this fact, Ladakhis are very enthusiastic about being a part of India and participating in Indian political and cultural life as they have little sympathy for Muslim-Kashmiri inspired Kashmiri separatism and nationalism or desire to live with their brethren in Chinese-ruled Tibet. This desire for security and integration has made Ladakhis increasingly conducive to supporting the BJP. Additionally the BJP’s overall support of smaller states has raised hopes that eventually the BJP will support statehood for Ladakh, a key desire of many Ladakhis who do not wish to live in Muslim-dominated Kashmir. Additionally, many Ladakhis fear that Muslim immigration and births will soon deprive their region of its Buddhist Ladakhi majority. Most of the Muslims in Ladakh live in the western Kargil district of Ladakh and are distinct from Muslims from the Kashmir Valley; they are Shia Muslims ethnically related to the Ladakhis. As such, Modi’s visit to Ladakh in particular was as much about shoring up his party’s support there as it was about demonstrating his commitment towards Kashmir. Thupstan Chhewang, the sole Member of Parliament in India’s Ladakh, is a member of the BJP. He won his seat in May 2014 by a razor-thin margin of just 36 votes. His election represents the first time a member of the BJP has won a seat from Ladakh. Modi’s wish is to use this victory as a stepping stone to increase the BJP’s role in Kashmir’s politics, which have long been dominated by the Jammu and Kashmir National Conference (JKN), a local political party allied with the national Indian National Congress, BJP’s rival. In May 2014’s national elections, the JKN did not win any of Kashmir’s 6 seats in India’s parliament, while the BJP won 3. The JKN still forms the state government in Kashmir though but assembly polls are later this year. The BJP’s goals are to increase its share of parliamentary seats in the state for the next national election in 2019 and to form the next government in Kashmir after 2014’s assembly polls. In order to do this, it must consolidate the Hindu and Buddhist votes and win all the assembly seats in Jammu and Ladakh. This is a winning strategy–consolidation of non-Muslim votes–and has helped the BJP enormously in states such as Bihar and Uttar Pradesh earlier this year. While the BJP had previously written off Muslim-majority Kashmir, a strategy of consolidation actually makes it winnable. The BJP also aims to win the Shia Muslim votes of Kargil, as it has a history of doing better with Shia Muslims than Sunni Muslims. If the BJP can win these votes in addition to the nearly certain Hindu and Buddhist votes of the rest of Ladakh and Jammu, it will probably garner the seats needed to come to power in Kashmir, a major achievement for a Hindu oriented party in a Muslim majority region. By promising voters of the region development as well as recognition of their culture, Modi is helping both his party and the people of Ladakh, both of whom share common goals. Ladakhi votes may well help bring the BJP to power in Kashmir in 2014 and for a long time after if the BJP’s current rhetoric and strategies yield fruit. Narendra Modi has visited Kashmir twice in two months and is the first Indian PM to visit the region since 1999.